Lucy Culliton frequently paints self-portraits that reference the subject she is currently exploring in her art. At the moment she is painting animals and is pictured here in a sea of fantail pigeons, all of which belong to her. Born in Sydney in 1966, Culliton studied at the National Art School. She now lives at Bibbenluke, NSW, where she paints full-time. She has a menagerie of animals and a lovely garden, which she uses as subject matter for her paintings. 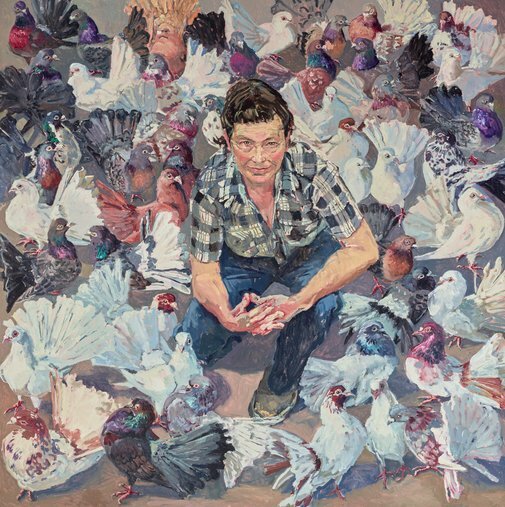 Culliton won the 2006 Portia Geach Memorial Award and is a regular finalist in the Archibald, Wynne and Sulman Prizes. This year she is a finalist in all three.